So, my little Max is ten years old. Let that one sink in. 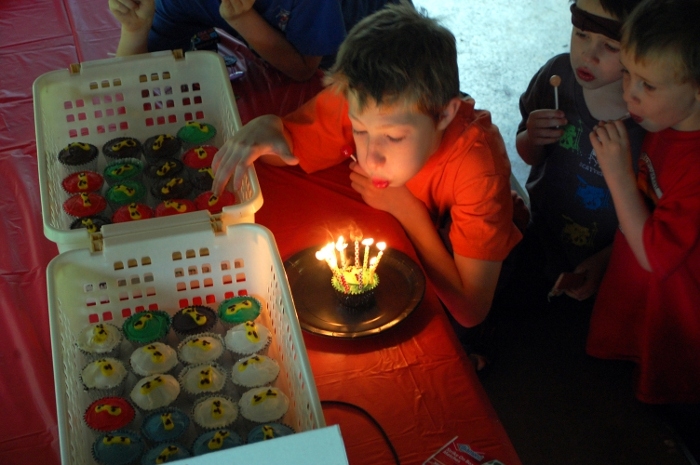 For this milestone birthday, we wanted to throw him a birthday party that was fun, and memorable, but not really, really, ridiculously expensive – and also pretty easy to put together. Does that seem like too much to ask? I think we managed it, though, and here’s how. Caution: this post is LONG and PHOTO HEAVY. See more after the jump. Party Prep: We made these cute little invitations with the printer, colored cardstock scraps I already had, and a marker. We had the party at a local park (free, and less stress-cleaning involved than having it at the house) at 10 am – after breakfast, before lunch. Snacks and cake. In our group of friends it’s most common to invite whole families to come hang out at the party, so we were looking at 12-18 kids attending. The possible range of people attending plus the widely varied ages of the children coming (not counting Ivy, kids attending were between 2 and 11) presented a special planning challenge. Arrive, receive ninja headband. Snacks and water available throughout. “Follow the Ninja” (follow the leader) as part of ‘ninja training.’ This was an unexpected hit, I get the feeling many of the kids had never played it before. 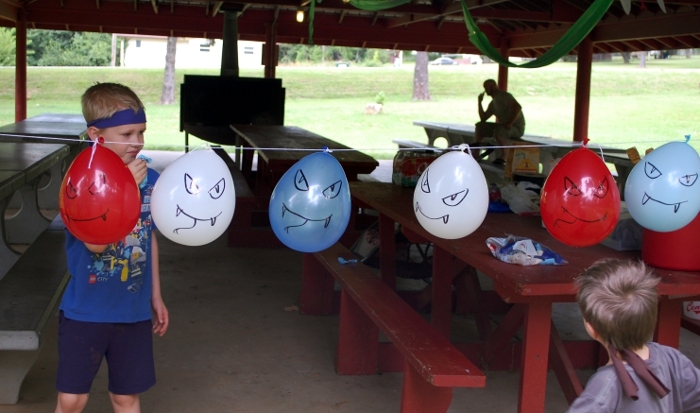 Serpentine battle: they used their swords to defeat (pop) all of the Serpentine (balloons) we had strung up. They enjoyed this as well. Piñata time! The kids were still pumped from defeating the Serpentine, one boy said, “It was so easy! We need a bigger serpent to fight!” Couldn’t ask for a better segue than that. Free play until pickup/parents get tired and leave. 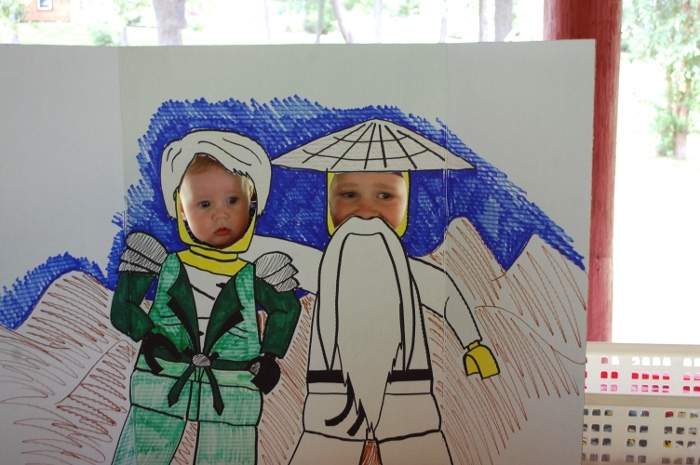 They enjoyed the cupcakes, snacks, piñata prizes, and swords for a good half hour after present opening. Clean up, go home, rest. Okay! Here are the details and cost breakdown! 4 dozen cupcakes: about $12. I purchased 2 cake mixes, 2 containers premade frosting, pack of muffin liners, tube of yellow icing, tube of black gel icing, pack of candles. Economical option: Make your own cake OR frosting from scratch OR just mix up the yellow and black yourself, save $4-$8. Great Devourer Piñata: about $4. I purchased 2 colors of crepe paper, 1 plastic party tablecloth, and a sheet of bright green posterboard. 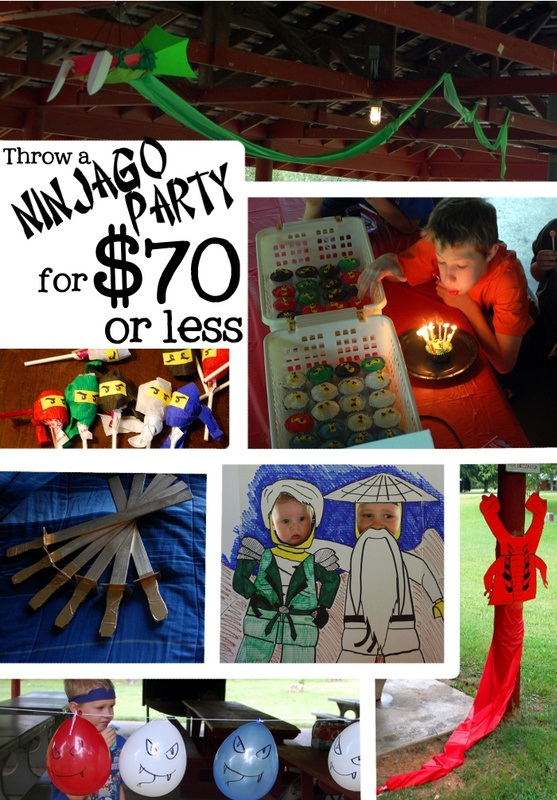 I’ve made $2 piñatas for birthday parties before, this time I went big! Just the head is the piñata, obviously. The frill is made of posterboard and the tail is made of the plastic tablecloth cut into strips taped together to be longer. Greg helped me rig it so we could raise and lower the head without pulling the tail off, so it looked like the snake was attacking. My picture doesn’t do it justice, the kids thought it was awesome. Piñata Filling: about $12. I purchased 9 packs of party favors from the Dollar Tree and 1 pack of regular Dum-Dums to go in the piñata. 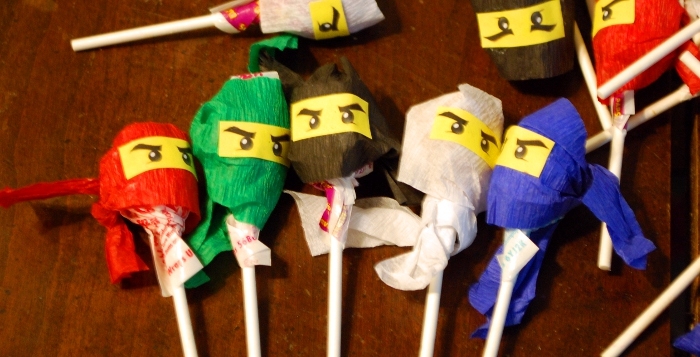 I always try to load piñatas with mostly non-food items – I hate when I take my kids to a party and the piñata is stuffed with loads of cheap low-quality candy. I end up sneaking most of it into the trash. Economical Option: If you chose a cheaper filler, you could probably save $5-$7. 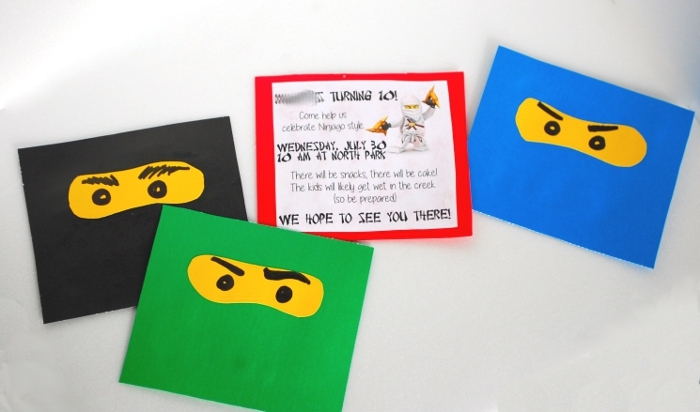 We tied crepe paper to the suckers and glued little ninja eyes I printed out onto them to make them ninjas. Child labor made this go much faster. Ninja Swords: about $10. I purchased a can of gold spray paint, a roll of gold duct tape, and 6 5-gallon paint sticks. I got 10 of the small paint sticks for free and the kids found two more in the house which they had me turn into swords for a total of 18 swords. 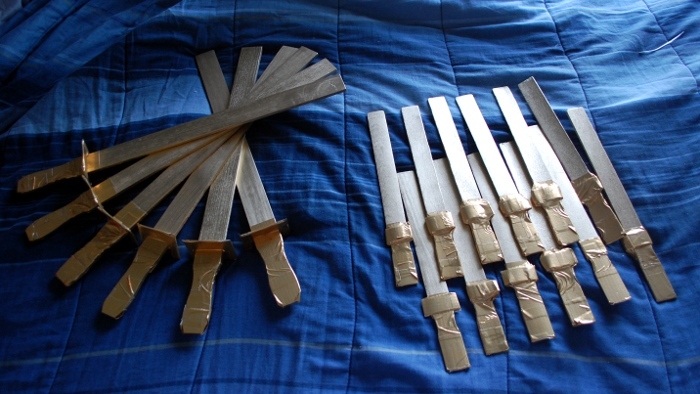 Economical Option: You could leave the ‘blade’ of the swords unpainted (or use whatever paint you have around the house), and use whatever duct tape or electrical tape you have around the house for the hilts and save between $6 and $7. Ninja Headbands: about $5. I purchased five t-shirts from the Dollar Tree in the five ninja colors (red, white, blue, black, green) and cut the bottom part into strips for headbands. These doubled as blindfolds for piñata time! Fangpyre Decoration: about $2.50. I purchased two sheets of red posterboard and a red plastic party tablecloth. 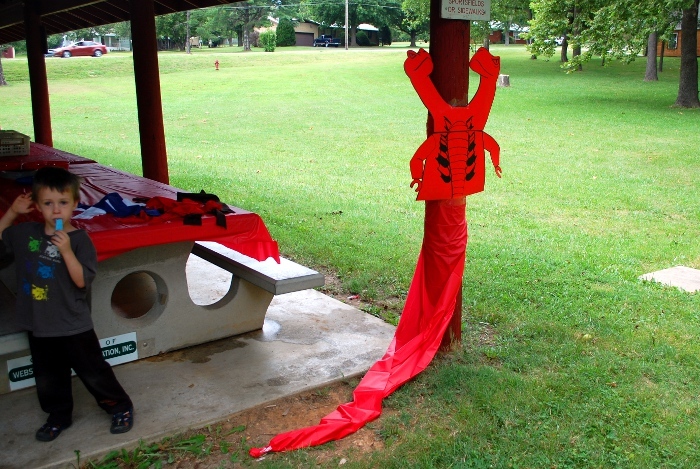 I made the head and body out of the posterboard (with folded “sticks” of posterboard taped to the back of the heads to hold them up), taped the tablecloth around a pavilion pole, put a piece of tape at the end of the ‘tail’ to gather it to a point, and done. By the way, a hammer and some small nails would have made putting him up so. Much. Easier. Lloyd and Sensei Wu Photobooth: $1. I purchased one cardboard trifold presentation board (think a science fair board) at the Dollar Tree. The Serpentine Army: about $2. I purchased two packs of balloons, I didn’t even use all of them. We strung them up between poles of the pavilion and I drew simple snake faces on them with a marker. Tableware and Food: about $20. I purchased two red plastic tablecloths, a pack of paper plates, a pack of napkins, two bags of tortilla chips (we served them with salsa I made from our shockingly-not-dead garden), a few pounds of grapes (on sale) and a case of water bottles. That’s it! It was fun, and I put it together in about two days. It cost me less than $70 to do, if you take the economical options you might be able to do it for less than $50. I would have made some more decorations if I’d had more time, but the kids enjoyed it, and isn’t that what matters? This entry was posted in How To, Life in General, Other Projects.